It’s a peculiar feeling the first time you look into the eyes of an Orangutan. Mostly because you know they’re probably thinking the same as you – “Well he’s an odd looking chap” – is the immediate thought – “odd, but I can definitely see something of myself in those roguish good looks“. The likeness is perhaps more prevalent in some, ginger hairy people in particular, but it’s definitely there in us all. The human like emotion in their eyes is no facade; nor is the the tenderness and loving, the spitefulness and squabbles or the way they pick their nose and talk with mouths full. It’s a well known fact that we share around 97% of our genetic make up with Orangutans, but unfortunately it’s not that which links us the most. First and foremost is the ruthless clearance by humans of South East Asian rainforest which has all but decimated their habitat and almost wiped them from existence, with only neighbouring Sumatra and Borneo surviving as the remaining refuge for wild Orangutans. Secondly, and more encouragingly, is the ongoing conservation work to restore and rehabilitate their numbers, and it was this which we had eagerly come to see. Tanjung Puting National Park sits in the central southern seat of Borneo, an island split into two between Malaysia and Indonesia, and getting here was laborious as expected. Three flights in one day before a 16 hour bus ride got us to the nearby town of Pangkalan Bun, from where we set about organising a boat to take us into the park. Not easy when you turn up on a friday, the Muslim religious day, to find everything shut. Nonetheless, we eventually found a decidedly untrustworthy local businessman to help, and being our only viable option, booked ourselves two berths aboard a klotok – an Indonesian riverboat – for the next day. It’s the klotok which makes the trip as magical as it is. Within minutes of leaving the grubby port of Kumai, close to the Java Sea, we had swung onto Sungai Sekonyer and into the national park. Immediately our surroundings changed. Reed filled marshes became low lying mangrove swamps and then before we knew it, we were in the jungle. 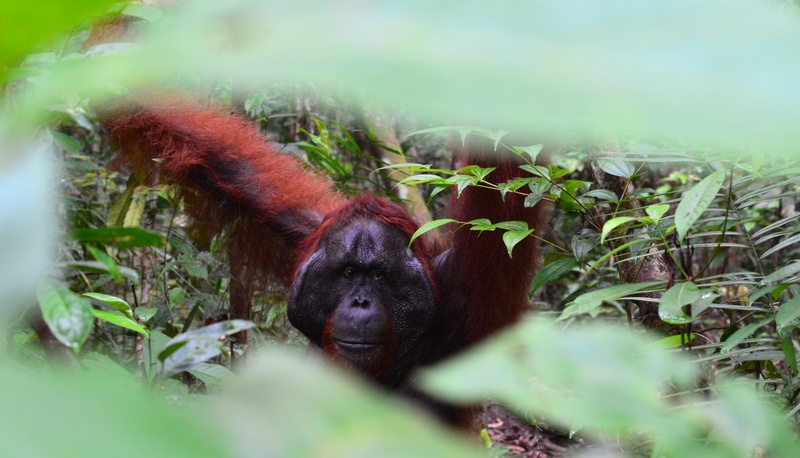 The densely packed beds of leaves that serve as Orangutan nests were spotted straight away in the tree tops, and then to much excitement came our first actual sighting, albeit barely visible through thick foliage. We pressed on. The slow put-put of the boat became increasingly inaudible below the rising noise of the forest around us, and before long the banks of the river exploded into life. 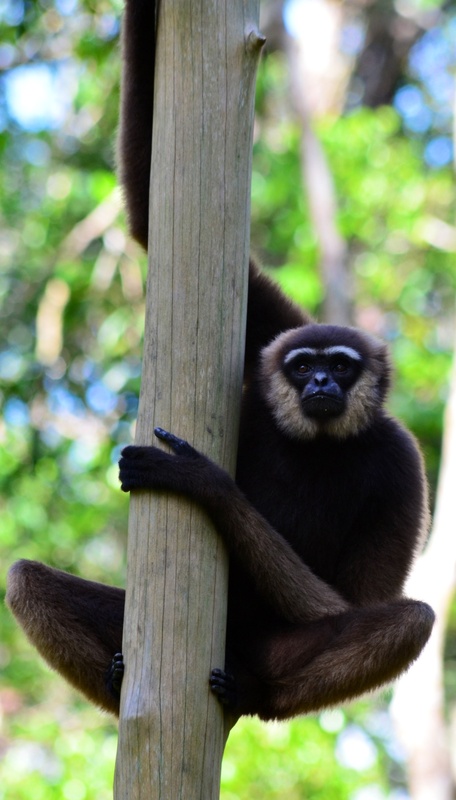 Proboscis monkeys perched on each side of us, their bulbous noses instantly recognisable, while macaques chattered excitedly, gibbons whooped and occasional grey longurs sat solemnly alone. There was a cacophony of noise and colour, and it was to be this way for the next few days. Shimmering dragonflies buzzed in and out of the boat, while butterflies, some as big as your hand, fluttered on the river breeze. We saw numerous kingfishers, hornbills and storks, while monitor lizards and a baby python fulfilled our reptilian quota. At night mattresses and mosquito nets were pulled onto the deck, and after the lights had gone out and the locusts, stick insects and mammoth moths had dispersed, we would fall asleep to a rainforest symphony. Despite the relative ease in which the river here can be accessed, our surroundings fell straight from the pages of The Heart of Darkness – the river blackened, the trees closed in over us, and the sense of entering the unknown increased. 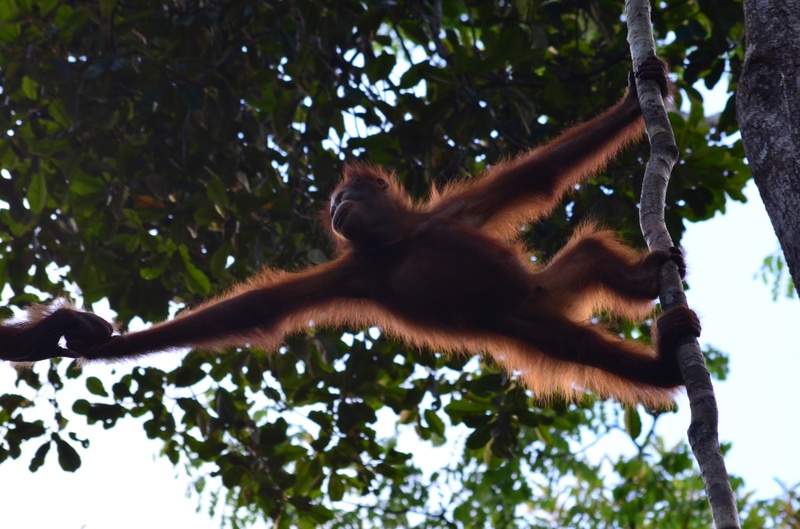 A rustle of leaves high above us is the first indication that an Orangutan is on its way. Silence follows, before another rustle and a sudden flash of orange. Then out of the leaves there appears a face, wide eyes peering down upon us inquisitively. He looks for 30 seconds or so, surveying the scene below before deciding there’s nothing of interest to hang around for and disappears from view, clattering off through the canopy. Two minutes later we arrive at a small clearing to find him sat in front of us, now otherwise engaged with a fistful of bananas. This is the first feeding station at Tanjung Harapan. Orangutan studies and rehabilitation in Tanjung Puting began in 1971, a process which saw orphaned and former captive Orangutans released into the wild where a population was already present. Due to the domestic upbringing of some and the lack of natural habitat, this reintroduction to the jungle involved a daily feeding at three platforms throughout the park. All of the Orangutans here live in the wild so attendance is voluntary, and while some are clearly dependent on human influence there are plenty that rarely come for food, if at all. The name Orangutan comes from the Malay words of Orang (man) and Hutan (forest) – making it a rough translation of ‘Man of the forest‘. Now while they probably have similar hygiene levels to the crazy man who used to live in the woods near to where I grew up, I’d say they’re definitely more interesting to watch. The beauty of seeing them at the feeding times is not when sitting on a platform in front of camera clad onlookers, but in their arrival and departure. It was breathtaking to see them swinging from branch to branch, performing acrobatics as they bounced trees back and forth for leverage along the way. Just gazing around the canopy we would see various apes high above; sometimes socialising with another, perhaps a mother doting on her baby or two youngsters playing, but often they’d be patiently sitting alone while waiting for the dominant male to clear off so they could eat. Their behaviour towards us was largely indifferent, many have always known humans after all, so aside from one branch hurling episode from a stroppy teenager they were mostly oblivious to our attention. They were absolutely captivating to watch. We spent hours with them, more than once being the last ones to leave, and standing beneath them with necks craned up above as we looked on in silence is definitely a memory that won’t disappear in a hurry. Especially not when they empty their bowels onto you, as Jamie found out. After a non eventful night hike on our final evening – we saw none of the Clouded Leopards, Sun Bears or Slow Loris’ that we’d hoped for, only Fire Flies, some glow in the dark mushrooms (imagine the trip on those) and heaps of terrifying spiders – we awoke to our final day in the jungle. Departing was a struggle. Leaving the Orangutans each day was bad enough – Jamie had to be dragged out by her ankles on more than one occasion – but the real sadness for me was leaving the chaotic calm of the rainforest itself. Setting the klotok downriver we saw more wild Orangutans, two of which we caught by surprise on the bank and another large male resourcefully using a huge leaf as protection from a tropical rainstorm, before a quick and sodden visit to a local village. It was as we were almost out of the jungle that an unbelievable few days was capped off in style with the sighting of a three metre Crocodile watching us from the murky waters. It was a timely reminder that the rainforest habitat and its dangers here are very much real – an English tourist was killed in the river here in 2002 – but far more so are the dangers of us to it. Illegal mining and deforestation for timber and palm oil plantations still goes on here and across Indonesia and as long as it does, the very existence of it’s wildlife is under threat. 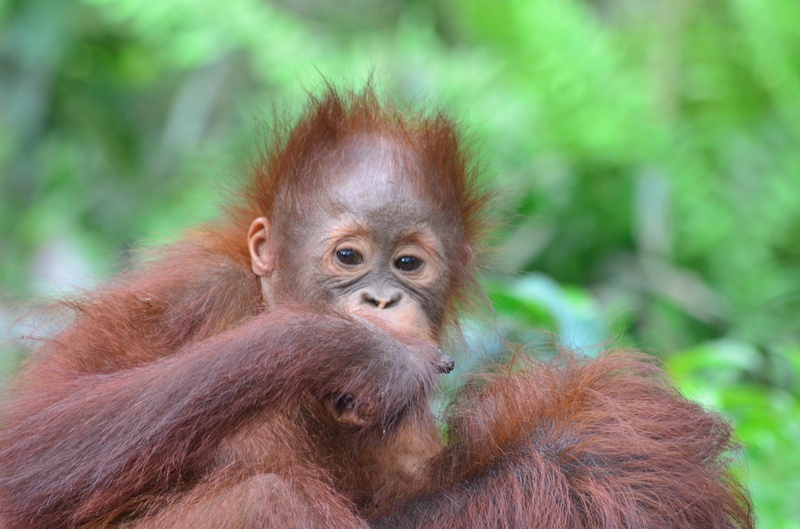 It is estimated that if rainforest clearance continues at the same rate at is, then by 2022 over 98% of Indonesia’s natural forest will have gone, probably taking it with the wild Orangutan. And no matter if you have experience of these wonderful creatures at first hand or not, it’s glaringly obvious that this would be an absolute tragedy. Even if they are just ginger hairy people.